The Jazz Session celebrates 400 episodes with pianist, educator and former Jazz Messenger Donald Brown. This interview was recorded at Brown’s home in Knoxville, TN, during the first part of the “Jazz Or Bust” Tour. In this interview, Brown talks about his early days in Memphis; why writing music has always been important to him; his R&B roots; the injuries he sustained through improper technique and how they’ve affected his career; and his forthcoming recording project. Note: Except for the first track, the music in this interview comes from Brown’s 2008 recording Fast Forward To The Past (Space Time Records). The first track is from a compilation called Tenors & Satin: The Knoxville Jazz Session. Wonderful to hear such a lengthy interview with Donald. I particularly appreciated hearing Donald’s account of his mentorship with James Williams. I, too, was taught informally by James in my formative years in Memphis. He brought tons of records to my house to check out when I was coming up in high school. I attended Memphis State at that time and was at James’ house for that wonderful lunch hang with Chick Corea that Donald spoke of. Great memories. I’m REALLY glad to hear that Donald’s hand problems were repairable and that his wonderful voice on the piano has been spared. God bless you, Donald. My world is much better for having you in it. Keep the great music coming. An excellent, insightful interview delving into the mind of an unquenchable creative force. The wisdom, logic and clear unbiased observations reveal great gems of understanding unshackled by ego. 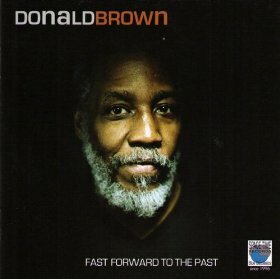 Donald Brown was my teacher at Berklee and those lessons continue to inform my development and teaching to this day. His playing has been an inspiration and if at times the delivery is affected (through the physical limitations he spoke of) the intent of his ideas radiate a musical message full of power and individuality whilst completely connecting to the source. As a composer he is one of the most prolific, inventive and singular voices in contemporary music and has been so through four fruitful decades of purposeful music making. A very important interview, with one of music’s shining artists, bravo.